← Have you ever tried Onigiri? 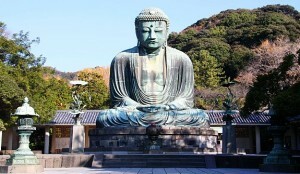 Kamakura is located close to Liberty Cove House. You take JR train from Yokosuka station. It takes about 20 minutes. Kamakura became the political center of Japan, when Minamoto Yoritomo chose the city as the seat for his new military government in 1192. The Kamakura government continued to rule Japan for over a century, first under the Minamoto shogun and then under the Hojo regents. After the decline of the Kamakura government in the 14th century and the establishment of its successor, the Muromachi or Ashikaga government in Kyoto, Kamakura remained the political center of Eastern Japan for some time before losing its position to other cities.